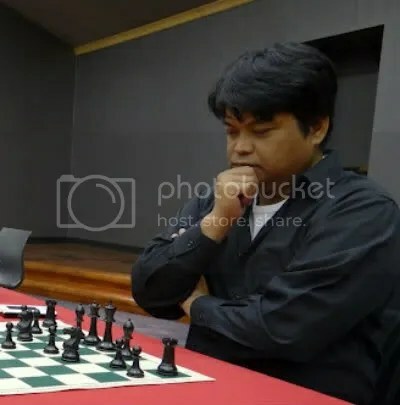 Enrico Sevillano, a U.S. based Filipino (Cebuano) International Master, the 1986 Asian junior champion, two time Philippine Chess Olympiad player (1992 & 1994), 2008 U.S. Open Champion and the first Filipino ever to qualify for the U.S. Championship in 2009, won the 21st Metropolitan Chess FIDE Invitational, a Grandmaster norm 10 player round-robin tournament held at the Radisson Los Angeles Airport Hotel on August 3-7, 2012. “Ikong” Sevillano, as fondly called by the old-timers and those who knows him i.e. his friends & fans, was half-a-point behind the leader IM Marc Arnold, the 2012 US Junior Champion, going into the penultimate round when he rallied intensely with two consecutive wins against USA’s IM Melikset Khachiyan (R-8) and IM Levon Altounian (R-9) respectively and finished a clear 1st scoring 6.0/9 points (5Wins-2Draws-2Losses), half point ahead of Super GM Robert Hess USA(2624) and IM Roman Yankovsky RUS(2468) who both tied at 2nd place with 5.5/9. Erstwhile leader IM Marc Arnold was relegated to solo 4th place with 5.0/9 owing to his 9th round loss to GM Hess. With this feat, IM Enrico Sevillano USA(2526) also finally completed his much coveted 3rd and final Grandmaster norm for FIDE’s International Grandmaster Title.